Schuman & Associates LLC, established in 1988, is a full service real estate law firm providing services to its clients throughout all aspects of their real estate legal transactions. Schuman & Associates real estate lawyers handle the complete range of residential and commercial real estate legal matters, including assisting clients with purchasing and selling cooperative apartments, condominiums, brownstones, single-family houses and multi-family buildings. Schuman & Associates also provides real estate legal services in regard to purchasing, selling, leasing, or subleasing retail, commercial, and industrial properties. Additionally, the real estate law firm of Schuman & Associates offers assistance to its clients in forming limited liability companies and partnerships, handles I.R.C.1031 "Tax Deferred" Exchange Transactions, and provides real estate legal services to co-op boards, lending institutions, and managing agents in connection with apartment sales, management contracts, and building finance issues. Schuman & Associates LLC, a Manhattan real estate law firm, is dedicated to helping our clients achieve their goals with experienced real estate legal counsel and a personal hands-on approach. Schuman real estate attorneys work with our clients to explain every detail involved in their particular real estate transaction. Our real estate attorneys and staff are strong advocates for our clients and strive to make your deal as smooth and stress free as possible. Schuman real estate attorneys make it our business to be well informed, so that we can keep our clients informed. As caring legal real estate counsel, we are particularly sensitive to the needs of first-time buyers and pride ourselves on being a calming influence in the buying and selling process. Schuman & Associates is well known in New York real estate as a real estate law firm with experienced and talented attorneys who take the time to build relationships with clients and with real estate brokers through professional, personable, and responsive action. We make a point of working together as a team to bring the desired results to all parties involved in the real estate transaction. We, at Schuman & Associates have built our reputation on providing thorough and personalized service in each aspect of every transaction. Schuman & Associates LLC in-depth real estate legal experience extends to international real estate buyers and sellers. Our real estate attorneys are knowledgeable of the concerns of international buyers and sellers, including the Foreign Investment in Real Property Tax Act of 1980 (FIRPTA). 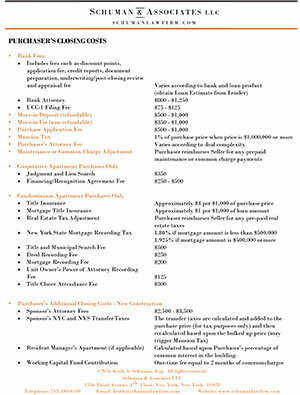 The home buyer's guide, A Guide to Purchasing a Home in New York is a complete and concise overview of the home buying process. Manhattan real estate brokers refer to this invaluable tool, written by Keith A. Schuman, Esq., as the New York residential real estate bible.